Feel free to bring in all kinds of things! We accept almost anything, if we can put a price on it we’ll give you credit. 50% of what WE are going to Sell it for. Example: A Music CD that we will sell for $5.00, you will recieve $2.50 in credit. under a first and last name of your choosing. We Keep Credit on file for up to 1 year from the last purchase date. they work in a Ladder scale, meaning you can apply the item towards itself and everything below it, but not above it. The reasons for this are because each one is slightly more difficult to get in than the one below it and also to keep that item in stock. Otherwise someone could bring in Magazines and wipe out our stock of DVD’s, it’s basically to keep things fair, that way if you bring Games in we’ve got Games for you to choose from. 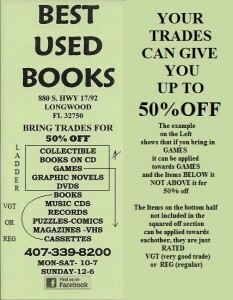 but NOT REG towards VGT for 50%off. This ensures that if you’ve brought VGT items in we will have VGT items in stock. It wouldn’t be fair for someone to bring a worn older titled James Patterson Paperback(REG) and use it towards a Brand New Hardcover (VGT). You can Drop off One Box, start a credit, and leave if you do not have time to shop, but of course, we’d love it if you did. Just remember it Expires after 1 Year with no purchases. An example of Dropping off in Bulk is say, you bring us 3 boxes, we’d ask you to spend $10.00 that day (1st box is a given, other 2- $5.00 per box) it helps us have THINGS GOING OUT AS THAT MUCH IS COMING IN . It is also to compensate for the cost of processing your trades in “bulk” form. If you are too busy to look, we will not be able to accept your trades. We then Ask that you come back when you have the time to shop. 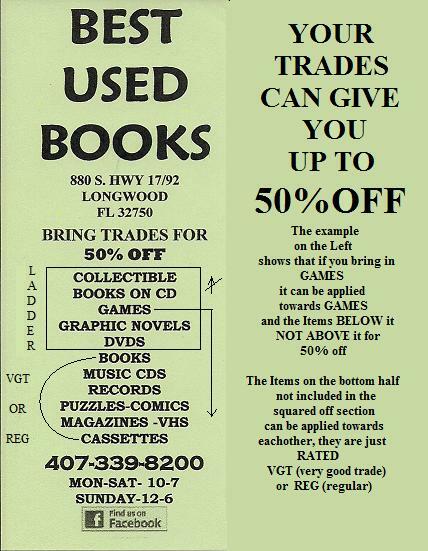 We appreciate the understanding in this matter, we receive a lot of trades and processing them is more than half the work here at Best Used Books. This policy has helped us recycle unwanted items from customers, into items that are desired by others. All the while allowing the customer who dropped the items off to receive a discount on items they want at that moment, or later in the future.